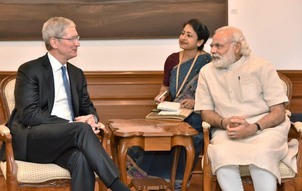 New Delhi, May 21 (PTI) Showing interest in making Apple products in India, the global technology giant’s chief Tim Cook on Saturday discussed with Prime Minister Narendra Modi the “possibilities of manufacturing” and tapping the young talent pool in the country. On his maiden visit to India, the Apple CEO also discussed with Modi issues regarding cyber-security and data encryption. “Cook shared Apple Inc’s future plans for India. He spoke of the possibilities of manufacturing and retailing in India. He appreciated the breadth of young talent in India and said the youth have significant skills which Apple would like to tap,” an official statement said. The head of the US-based Apple, which makes iconic iPhones and Mac computers, has already announced during this trip setting of an app development centre in Bengaluru and one for maps in Hyderabad. During his meeting with Modi, Cook highlighted the immense potential for app development in the country. He also launched an updated version of the PM’s mobile app at the meeting. He narrated to Prime Minister the experiences including a visit to Siddhivinayak temple in Mumbai and watching a cricket match in Kanpur. Modi, appreciating Cook, said in India “seeing is believing” and added these experiences would definitely steer his business decisions. After the meeting, Modi tweeted: “Thank you @tim_cook! Friends, welcome & happy volunteering. Your views and efforts are always enriching.” He also shared photos with the Apple CEO on his Twitter handle. He also appreciated Prime Minister’s initiatives on ease of doing business and renewable energy, the statement read. Cupertino-based Apple runs on 93 per cent renewable energy and Cook spoke of plans to move Apple’s entire supply chain to renewable energy.